As expected, the Portland Trail Blazers selected Greg Oden with their number one draft pick in the 2007 NBA draft. When considering the rarity of such an athletic and productive big man, the choice was easy. The Blazers will now be able to build around a frontcourt of LaMarcus Aldridge and Greg ("I look 40 years old")) Oden. Paired with a developing Jarrett Jack and 2006 rookie of the year winner, Brandon Roy, the Blazers have done a complete 180 from two years ago when they were the laughing stock of the league. On draft night, not only did the GM, Kevin Pritchard, select one of the most highly touted prospects in years, but he found a way to ship out Zach Randolph and clear some cap space. In exchange for Randolp, who will go to the Knicks with teammates Dan Dickau and Fred Jones, the Blazers will receive Channing Frye and Steve Francis. It is believed that Francis's contract will be bought out, thus leaving the point guard job to Jack and emerging Sergio (the Spanish gypsy, magician) Rodriguez. Channing Frye, meanwhile, will back up Aldridge and split time with Oden while he develops. I just received a message from Old in Port Alexander, where he is staying with Kesia and her father at his home in the wild Alaskan bush. Due to the lack of technology in Canada, er, um Russia, I mean Alaska, and them being so far removed from civilization, Old has been left with no choice but to rely on Morse code to communicate with the modern world. I'll do my best to translate his coded messages in order to document his time away from Stumptown. He first made contact with me a couple hours ago, nearly three days after he departed from Portland. His message was brief, simply telling me he and Kes made it safely to their destination, as well as some of the details of their trip there. Although making it safely, their journey there wasn't without its troubles. They had to fly from Seattle to Sitka, but due to bad weather, they had to detour to Anadyr, Russia, where they then boarded a boat and crossed the Bering Sea. Although the ship's captains made their best efforts to accommodate the passengers, it didn't make th eir 2-day subsistence on potatoes and vodka any easier. What's more, they were briefly forced in to slavery by a group of Siberians that were sharing their 50-bed, 15 by 20 foot sleep deck. 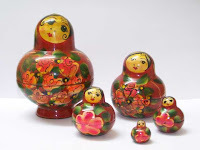 While not having to complete any inhumane tasks for their captors, they did, however, have to whittle babushka dolls for the Siberians to sell once they got to Alaska. 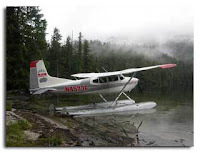 When they finally arrived in Alaska, they still had to board a sea plane to get to the remote island where Kesia's father, David, lives. In all, it was a two and a half day journey that had its ups and (more) downs. Now, they no longer have to worry about Siberian slave holders or arduous journeys across the Bering Straights. They can take comfort in the company of bald eagles, grizzly bears and mountain men, all while filling their days chopping wood and fishing. As the Morse codes come in, more updates will follow. I do now, and it's everything it's cracked up to be. For two and a half years, ever since I left the City by the Bay (one year in Denver, one and a half in the Stump), I've been left to do my dreaming and beauty sleeping on the floor. In that time, I've been lucky enough to have had air mattresses shielding me from the cold, hard floor, but two of them popped and for a good year of that time, I've only had a two-inch thick pad to aid my sleep. What's more, that pad is over 20 years old and was used by my parents in their younger years. Part of my insistence on not getting a bed can be blamed on my monk-like, ascetic existence, which consists solely of meditation, drinking green tea and detaching myself from all material things. Well, not really. I'm really just scared of committing to things and, by some twisted logic, I associate owning a bed with being settled and having a home. What I've been told, though, is that owning a bed simply means you value your sleep and care about having a healthy back. So, when my friend Jessica told me her friends were getting a new bed and needed to find a home for their old one, I reluctantly told her I'd take it. We ventured up to their residence in North Portland, threw the mattress in my car, tied the box-spring to the top, and headed back to my place to spruce up my room with this novel piece of furniture. It only took one night to realize it's not too late to sleep like a baby. If you're reading this, and you, too, have been without a bed, you should seriously consider the investment. It does wonders for your sleep. Good lookin' out, Jessica.